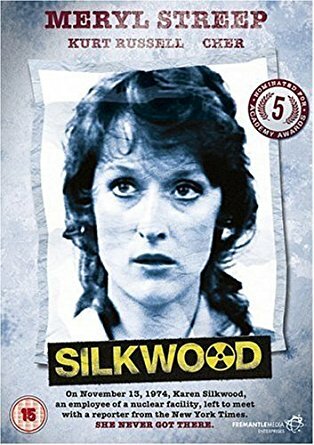 Brief Synopsis – A woman working in a nuclear facility suspects that her bosses are breaking laws relating to worker safety and tries to find a way to stop it. My Take on it – This is a film that I herd about even when I was a kid because I recall my parents going to see it when I was nine. For some reason, I believed at the time that it was a horror type thriller instead of a biographical drama. Meryl Streep is very impressive in the lead role and is great despite the fact that it isn’t such a glamorous kind of role to take on. The supporting cast is superb and I recognized a lot of famous bit-part actors in numerous roles of this film. Kurt Russell Cher are amazing in supporting roles because they are able to help keep a very deep storyline lighter due to their camaraderie and humor throughout. The way that the story is presented helps keep the mystery open as to whether she just wasn’t dreaming or if these events really happened. This film was written by Nora Ephron and it still amazes me hat she wrote this since the theme shown here are far away from the usual “light” rom-coms that she is largely known for. Bottom Line – Streep is impressive in this role which isn’t a very glamorous one. Russell and Cher both help keep the mood of this very deep storyline lighter by their humor and camaraderie. The story is presented really well and it gives us the impression that she isn’t actually imagined all that is happening to her. Sill amazes me to know that Ephron wrote this film because it’s much darker and dramatic than most of the rom-com films she wrote years later. REcommended!